UACJ Corporation established by merging the businesses of Furukawa-Sky Aluminum Corp. and	Sumitomo Light Metal Industries, Ltd.
UACJ Foil Malaysia Sdn. Bhd. established following the acquisition of aluminum foil manufacturing and sales company Hydro Aluminium Malaysia Sdn. Bhd. by consolidated subsidiary Nippon Foil Mfg. Co., Ltd.
UACJ Foil Corporation established by merging the businesses of consolidated subsidiaries Nippon Foil Mfg. 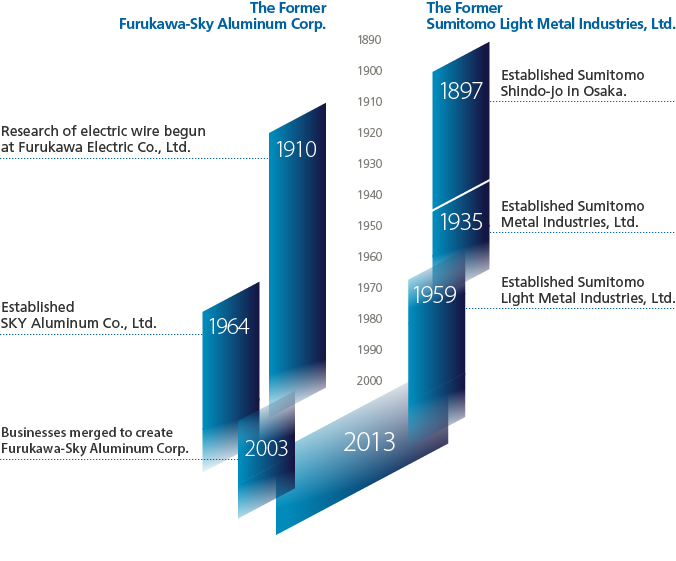 Co., Ltd. and Sumikei Aluminum Foil Co., Ltd. Signed formal agreement with Constellium N.V. to establish a joint venture company and collaborate in Body-in-White business in the USA. UACJ Trading (America) Co., Ltd. established by consolidated subsidiary UACJ Trading Corporation. Automotive parts manufacturer and seller Iwai Metal Central Mexico, S.A. de C.V. (currently UACJ Metal Components Central Mexico, S.A. de C.V.) began operations. “Global Step I” mid-term management plan announced. Furukawa UACJ Memory Disk Co., Ltd., manufacturer and seller of materials for aluminum memory disk substrates established through a joint venture with Furukawa Electric Co., Ltd., began operations. Integrated production started at the Rayong Works of UACJ (Thailand) Co., Ltd.
UACJ ELVAL HEAT EXCHANGER MATERIALS GmbH, sales company of automotive heat exchanger materials for European markets, began operations in Germany. Increased stake in RUYUAN DONGYANGGUANG UACJ FINE ALUMINUM FOIL CO., LTD., a supplier of automotive heat exchanger materials in China, and decision made to establish a joint-venture company, SHANGHAI UACJ DONGYANGGUANG ALUMINUM SALES CORPORATION, a sales company of heat exchanger materials in Shanghai, collaborating with the parent company of the aforementioned entity. Acquired a leading company in the North American automotive aluminum structural materials/parts market and launched it under the name of UACJ Automotive Whitehall Industries, Inc. Established UACJ North American Inc., a regional headquarters in the USA. UACJ Metal Components Corporation formed by merging three group companies: Nalco Iwai,NIKKEI KAKOH Co., Ltd. and Nalco Ena. Constellium-UACJ ABS LLC, a joint venture with Constellium N.V., became operational in the USA. Capital stock increased to ¥52.277 billion. UACJ Marketing & Processing Mexico, S.A. de C.V. a sales company of automotive parts,established in Mexico.